German Chancellor Angela Merkel and Austrian counterpart Sebastian Kurz held talks about Britain’s exit from the bloc in Berlin today. The leaders agreed to do “all we can” to stop a no-deal Brexit despite the tense deadlock in negotiations between the UK and EU. British officials have yet to agree a workable solution to the Irish border issue, the main sticking point in divorce talks. However, the EU is keen to keep close ties with the UK after Brexit, especially on security and defence issues. His remarks come ahead of Wednesday’s crunch European Council summit in the Austrian city of Salzburg. 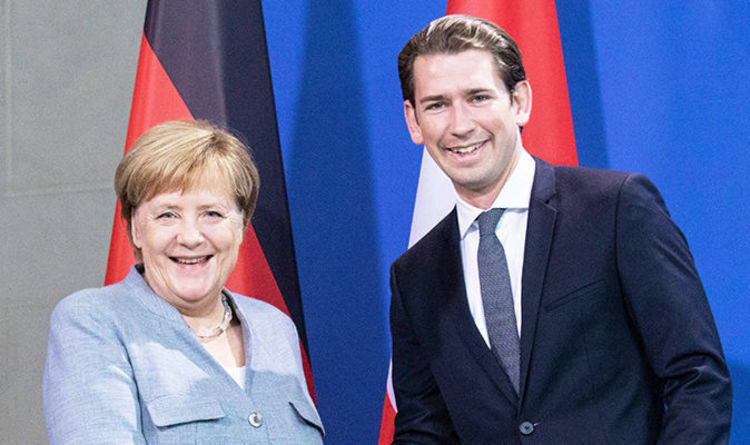 Mr Kurz will host the high-profile meeting because Vienna currently holds the EU’s rotating presidency. A spokesman for the European Council said: “The meeting will end with a meeting in EU27 format to discuss Brexit. Mr Kurz has previously been an outspoken critic of Brexit. Last month he referred to the UK’s vote to leave the European Union as “probably the worst decision of recent years”. But he said it was crucial to “secure an orderly future together” because of Britain’s importance on the world stage. Speaking at an event in Germany, he added: “The decision was taken and now it is about ensuring that contact remains good. Earlier today Cabinet minister Michael Gove backed Theresa May’s controversial Chequers plan for Brexit. The senior Vote Leave campaigner admitted the Chequers proposals had forced him to compromise on some of his beliefs. But Mr Gove insisted the most important issue now was ensuring Britain leaves the EU in “good order”.